To stain bacteria nuclear material by Giemsa’s staining technique. DNA is a principle genetic material of all micro-organisms except some viruses. Bacterial cell lacks a well-organised nucleus. It is the very essential structure of a living cell. Nucleus performs important functions like growth, metabolic activities, multiplication and transfer of hereditary characters. Nuclear material of bacteria is also called as nuclei chromatin body. Bacteria cell has haploid nuclear content and they possess a single copy of double-stranded DNA material. Besides DNA some bacteria may possess extra chromosomal material called as the plasmid. The nuclear material of bacteria is stained by using Giemsa’s method whereas other method’s that can be used are Feulgen’s method and Robinow’s method. A clean grease free slide it has taken and a thick smear is prepared by using a sterile wire loop. The slide is allowed to air dry and then the smear is fixed by using Bouin’s fixative for about 15 minutes here we avoid heat fixation step. Further after chemical fixation, the slide is treated with 1 N HCl solution in a water bath at 60°C for about 5 minutes. 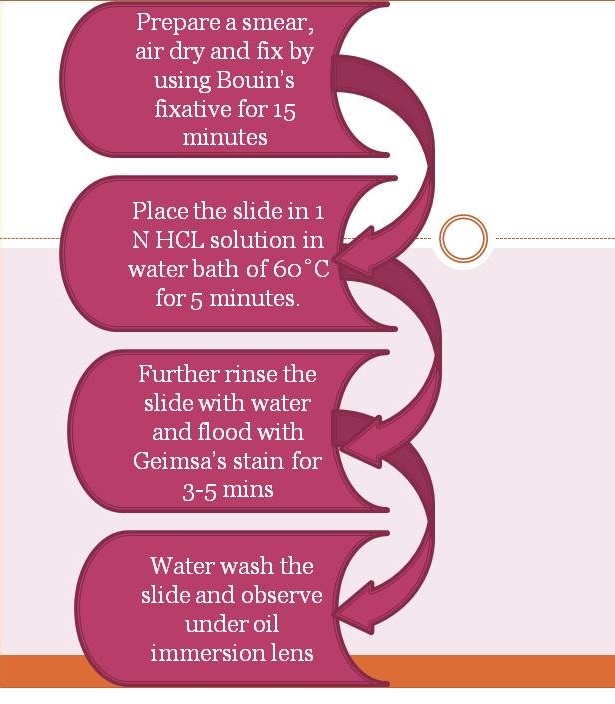 After 5 mins the slide is rinsed with water and flooded with Giemsa’s stain for about 3 to 5 minutes after that slide is observed under oil immersion lens. Giemsa’s stain is prepared by a mixture of two stains that are methylene blue ( basic dye) and eosin( acidic dye) so the resulting stain has properties of both dye. The chromatids of a cell are highly acidic in nature so when it reacts with Giemsa’s stain it gives a reddish purple colour to DNA. The RNA of a cell is removed by acid hydrolysis step in this step the smear is treated with 1 N HCl solution in a water bath of about 60°C temperature for 5 minutes during this step due to heat and acid the double bonds between the base pairs of RNA molecule get week and break.Whereas DNA material has triple bonds in between some base pairs so DNA molecule doesn’t get hydrolyzed and hence only DNA molecule get stain and cytoplasm remains colourless. The cytoplasm appears colourless whereas nuclear material appears purple in colour.